Kumai-san and Kanon begin the show just by the two of them and Kumai-san introduces herself as the “caster” of the show — a role that is usually reserved for Tokunaga Chinami. Kumai-chan starts by asking Kanon about her memories of summer. Kanon talks about how she bought the “3 Natsu Natsu Mini Berryz” mini-album because she wanted to wear the beach sandals that came with its limited edition. When she actually got them, though, she suddenly thought it’d be a waste to use them so she decided to just treasure them without using them. But the sad part happened when Kanon’s family moved out of that home. They got a moving contractor to do a thorough clean-up of the whole house and they, for some reason, threw Kanon’s beach sandals in the trash. Kumai-san is shocked to hear this and asks why they would just throw them away without asking first. Kanon explains that since her room was so messy, her mother had just told the contractors to throw away everything even resembling trash. Kumai-san wishes she’d have known this just a little bit earlier: she actually gave a pair of these beach sandals away to a fan at an event last summer. Kumai-san and Kanon introduce their super special guest of the week: Tokunaga Chinami! Chii says she’s kind of getting used to this nonsense about her being referred to as the guest. She quickly reassumes her position as the caster. Fan letter #1: The listener says he only just recently found out about this show and is already hooked. Chii-chan’s frequent fumbling of her words, Kumai-san’s weird interjections, the peculiar atmosphere on the show… the listener is so hooked on it all, he says he now listens to past episodes when he’s commuting to work, when he’s on his afternoon break, when he’s in the bath and when he’s about to sleep. He tried thinking about why he wasn’t listening to this show before and realized it was because of two reasons, namely Tokunaga Chinami and Kumai Yurina. He says the two don’t promote this show nearly enough and asks that they start doing so more. Chii says she’s very happy about such praise, but wonders if they’re really not doing enough to promote the show. 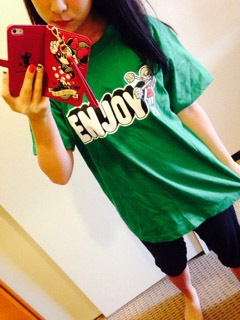 Chii thinks she actually does her fair share and asks Kanon how much she usually promotes things on her blog. Kanon answers that while she herself doesn’t do much promoting, she’s also the type of person who will look up upcoming events and concerts on her own even without hearing about it somewhere. She just recommends people to check artists’ official sites for that sort of information. Kanon offers that she can start promoting this radio show for Chii and Kumai-san, and the two sound very pleased with this offer, calling her a simply wonderful kouhai. Fan letter #2: With Chii and Kumai-san having both been idols for over 10 years, the listener asks them if there are any specific things that they unconsciously do in their daily lives that remind them of the fact that they’re, indeed, idols. Kumai-san talks about recently having rewatched a video that she did with her class in elementary school. It was just meant to be a little memory for them for later in life and it had everyone taking turns talking to the camera. Kumai-san had already joined the entertainment industry by then, and the way she held the microphone in the video was completely different from the rest of her classmates: whereas they would be wondering what the best way to hold it is or how it’s going to pick up their voices the best, Kumai-san was holding it all cool and professional-like. She was watching the video just thinking “what was I doing, trying to look all cool like that? !” That made her feel like an idol. Kanon says she’ll feel like this sometimes when meeting relatives or acquaintances for the first time in a long while. Especially the old uncles and such will want to come and shake the younger folks’ hands, but for Kanon, she’ll automatically switch into handshake event mode and do the handshake with both her hands. She’s also accidentally introduced herself as “Kanyon, aka Fukuda Kanon” at school at the start of a new term — obviously resulting in the whole classroom exploding with laughter. Chii has a story from when she was in junior high school. She had a very close friend those days who one day just out of the blue marveled how pure Chii’s eyes are. Chii just went “huh? !” and she couldn’t understand what she’d meant. The other day when she met this friend again after a while, she made a comment about Chii’s eyes having become darker. Chii says that even though she is an idol even now, she must’ve been even greater of an idol back in those days (around the time of “Jiriri Kiteru”). Chii adds, though, that if she’s walking outside with Maimi, no one will bother doing any double takes on her anymore as everyone’s eyes will be focused on Maimi. Kumai-san notes that Maimi is, indeed, just the perfect beauty. Topic #1: Previously on this corner Chii talked about Bakuwara Friends and its troubles. There’s now been a new development in the story. Chii says that after about three days or so after recording that previous show, Rinapuu approached her when they were waiting for their turn to go on stage at Hello!Con. Rinapuu told her that her next mission she wanted to do was to (again) take pictures with all five members of Bakuwara Friends (Michishige Sayumi, Suzuki Airi, Nakajima Saki, Kumai Yurina and Tokunaga Chinami). But she just left it at saying she wanted to do so; she didn’t actually take a picture with Chii right then and there. Chii wonders what the deal here is, and asks Kanon if Rinapuu is in fact quite shy. Kanon says Rinapuu gets quite clingy when she gets to know you well, and she suggests that in Chii’s situation, Rinapuu just wanted to come and have a conversation with her about something or other. Kanon says she still has lots of things she doesn’t quite understand about Rinapuu so she’s not all too sure about this, though. Chii doesn’t know what to think about the weird sense of distance between her and Rinapuu, and she’s not quite sure if this latest episode means they’ve gotten closer or if they’ve grown more distant. She promises to keep us updated on any future developments. Topic #2: Kanon has something to report on Sugaya Risako. Kanon talks about how S/mileage calls its fans “S/mileage Family” or “Shinseki no Kata” (“relatives”) (the latter draws laughter from the two hosts) and how °C-ute calls its fans “Team °C-ute” and so on. This prompted Kanon to ask Risako what Berryz call their fans, and Risako immediately replied “Berryz wota.” Kanon thought this was quite funny and she wants the hosts to confirm if what Risako said is accurate. Chii and Kumai-san both agree they should probably think of a better name than “Berryz wota.” Since “family” and “relatives” are taken, Chii suggests “Berryz Acquaintances” and is met with laughter. “What about Berryz Neighbors?“, asks Kumai-san. Chii says they’ve actually talked with all the members about how “Berryz wota” might be a little too crude, but she’s pretty sure the discussion ended in them agreeing that, at the end of the day, it’s the only name for their fans that feels right. Kanon says that it’s originally Wada-san who started using the name “relatives” to describe their fans, but Kanon says it kind of made her confused as to what kind of relatives that’s supposed to mean exactly. Thus, she says, she just refers to their fans as “otaku” even when addressing them on stage. Chii and Kumai-san, laughing, say “otaku” is way too direct. The hosts say they’re going to take some time to think of a new name for their fans. They promise to consult their PR Ambassador, Kanon, and get her approval before adopting it into use. 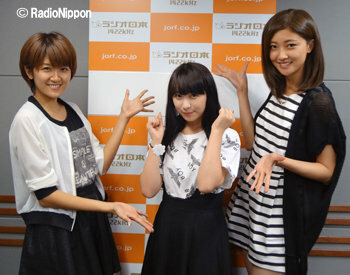 Chii: Our special guest was the PR Ambassador of Berryz Koubou, Fukuda Kanon! Thank you. Kanon: Thank you. Futsuu, Berryz Wota 10nen Yatterannai Desho!? Great Website. Would love it even more if you include the radio show audio in the blog. Also plz link the comments in the ‘Recent Comments’ tab; so that it can be followed to the thread/post. Also the website is neat but rather too plain… a banner or two would do. But plz no more Tsunku posters. @PizzaIsNotAvailableInMySlum. : The recent comments thing, the link to the comment in question is in the word “said” right after the name. We need more Tsunku pictures and banners. Just one isn’t enough!